I don't know about you, but I've endured a long, snowy, never-ending (did I mention long? ), winter. We had so much snow and such cold temps, I literally had not seen the ground in my backyard since November. This week the temperature is down right tropical- in the upper 60's! And as the sun warms us up, I find myself looking at my wardrobe wondering what to wear in this in-between-stage. This blog is a smattering of a few tips to help you make the transition into spring. 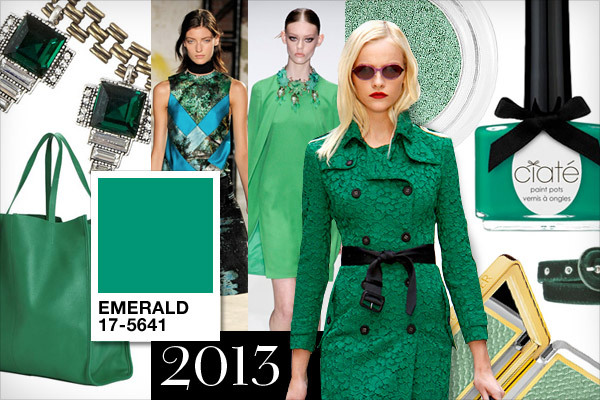 If you haven't heard already, Emerald is the Pantone (color) of 2013. I was bored to death of last year's coral, as it is not flattering on all skin tones. But green is a friendly color for everyone. From nail color, to accessories and separates, be bold and know that Emerald is not just for St. Paddy's Day. Be creative. Mix & match. Go for the gold...er, green! You know, I find hair trends to be so all-over the place. According to the runways, we're seeing a TON of braids, buns, parts and more braids. Some sources are saying bangs (or "fringe" for our friends in the UK) are du jour. I say- whether your hair is long or short do it a favor: get a trim and invest in professional color. No need to go lopping it all off (unless you want to). But I see too many women with trendy long hair...which needs a serious snip. Ladies: it grows back! This is the perfect time of year to trim up, sharpen the shape & maybe mix it up when it comes to color. DO remember this: you get what you pay for. Don't expect to look like Heidi Klum or Emma Watson when you hit up the local Dollar Cut Hut. Just sayin'. 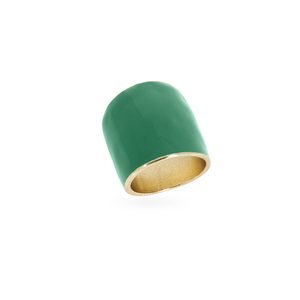 Emerald enamel & gold make one affordable statement ring. See above hair, and think accessories! Who would have thought? Turns out one of the big things coming off runways is hair accessories- headbands, feathers, wraps, flowers...its not just for little girls. This is where I shamelessly pitch my own company, House of Josefina. Find pieces which reflect your personality. If you're a little boho chic, go with it. If you tend to be more whimsical or romantic, or nerdy-- follow your instincts. I know as I choose jewelry for my store, I try to keep multiple tastes (and budgets) in mind. Some days, you might want to rock those bright hoop earrings. Other days, you want to grab a delicate necklace that says, "I'm beautiful and feminine." The moral of this story is: accessorize! Its a quick way to make YOUR statement. Maybe an edgy, studded leather bracelet is more your pace. So start making the transition into Spring. Shop now. Make yourself unique. And have fun doing it! As always, I encourage you to hit me up with any questions or comments you might have. You can also find specials and promos on my Facebook page- House of Josefina.